This study examines forest bioenergy related knowledge, perceptions, attitudes, and behavior amongst participants of national forestry training course in China. The participants are forestry professionals and are senior government officials in this area on a county level; additionally all have been working in the forestry field for more than ten years. Their perceptions and practices are worth examing as they directly influence local and regional decision makers, and could affect the adoption of forest bioenergy in the country. The purpose of this study was able to determine how well the professionals' practices and future preferences concerning the use of forest bioenergy fit together. A thorough assessment was conducted using a questionnaire of 74 professionals in Xiamen and Hangzhou (China). The results revealed that, firstly, their environmental behavior can be classified as being a low carbon lifestyle. Secondly, the professionals think that renewable energy has potential for use in the future, but less potential for forest bioenergy. Thirdly, the professionals' practices and future preferences concerning the use of forest bioenergy do not appear coherent. Fourthly, the professionals feel that the development of forest bioenergy requires increased cooperation between the government and enterprises with respect to the different functions of the forest and its impact on the ecosystem. 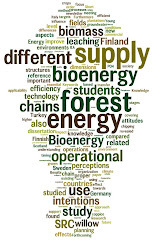 Finally, the findings indicate that bioenergy related education through different channels has to be improved. The findings create a foundation for further discussions regarding the use of forest as a source of renewable energy, as well as forest management in the country. ► Chinese professionals are positive towards renewable energy. ► Professionals' practices and future preferences on the use of bioenergy are not fit together. ► Bioenergy education has to be implemented and improved in China.